Walking down the gravel path to the south west corner of the Castle, the land drops down and offers a little more shelter in the lee of a band of trees. The ancient arched wall of the Monks’ Garden lies ahead and to the left, on a bank, sits the Orangery. In looks it is similar to the original Orangery which was attached to south facing side of the Georgian Highclere House which was almost exactly where I sit writing in my study today. In fact I have found an old plan which clearly shows the corridor leading to it. 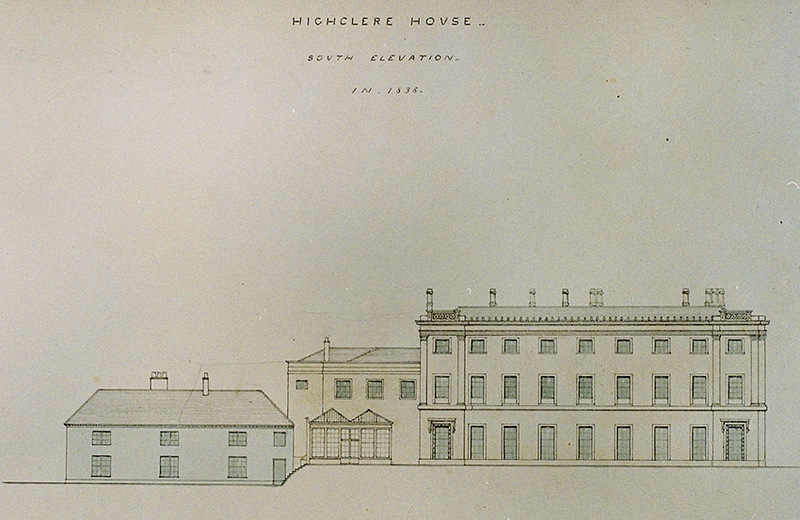 Charles Barry’s plan of the Georgian house, lobby to conservatory at the top! Charles Barry’s design for the Victorian house however was all about symmetry and balance. He called the new scheme for Highclere “Anglo-Italianate” and transformed the Castle into one of his most favourite works with his “lofty and beautiful tower” and “elevated angle turrets”. However, the move was accomplished although again there are notes on the issue of leaking rooves in it and the other conservatories after the re-location, alongside small sketch-plans of sections and of layouts of heating pipes. The Orangery survived well into the early-20th century when, once again, in 1939, the wooden structure had to be renewed. In the last few years Geordie and I have, in our turn, had to undertake a great deal of restoration and have renewed much of the structure. Before the 19th century glass buildings would have been an object of awe to the majority of the populace. Glass was heavily taxed making such buildings impossibly expensive for any but the wealthiest of the aristocracy. With the industrial revolution and the removal of the window tax, the Victorians’ fascination with flora and fauna led to a proliferation of various kinds of conservatories, orangeries and vineries of which the grandest were on estates such as Highclere. Highclere even had a “heathery” as the archives also refer to it as not being sufficiently weatherproof (9 Oct 1845). The ultimate status symbol, however, was a glass fernery which aimed to mimic the heat and humidity of the tropics. The Dutch may have had tulip fever in the 17th century but the Victorians had Fern Mania: in their homes, their art, their fabrics and their literature. It even had an official name – pferidomania. Highclere had one of course – added onto the back of the Orangery which we have also extensively restored in the last couple of years. 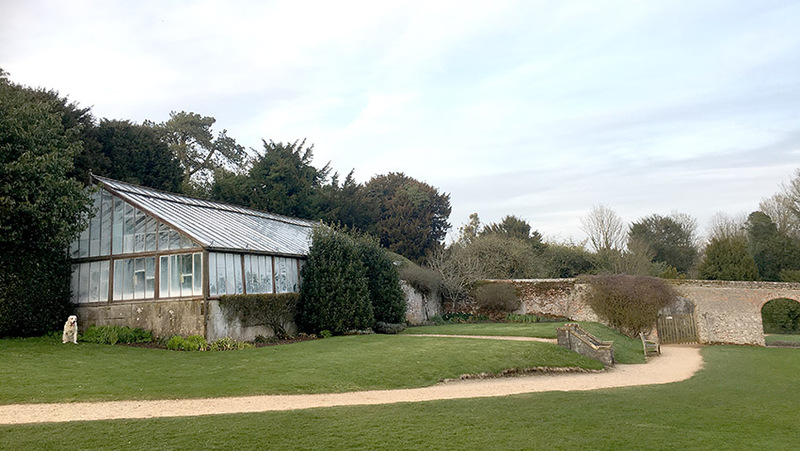 Beyond the Orangery are a further three greenhouses and cold frames all of which are much in use today by Head Gardener Matthew and Ben to prepare and grow on the plants for the Castle. At the moment they and the potting sheds are all full of bedding plants ready to go out into the herbaceous borders. If only it would stop raining……….. Your commentary was both fascinating and enlightening. I’ve never previously heard of a “heathery”. We, your readers/bloggers, are very fortunate that the plans you have shared and the documents that you have referred to, have been so carefully archived and maintained. You certainly are in a “living history”. A history to which you are writing your own pages for us and future generations. That is so awesome! It is a bit of a chaotic living history on my part! Having retired as the head gardener om a (much smaller) estate in the US, this has been one of my favorite posts. Damp cold winter mornings spent in the heat and humidity of the glass house were always a special part of our annual calendar, checking the thermometer every day waiting for suitable weather to bring the overgrown “babies” outside for their summer splendor. As one who finds the history of floral design to be fascinating, the history of the way a great house preserves specimens for a garden or house display is enlightening. Thank you for sharing insight into Highclere’s history. Thank you, Lady Carnarvon, for another glimpse into the past and present of the Castle. I look forward to another visit in the coming years. The seasons give us new versions of a familiar view. There are falling down brick shed further down – always something else! I loved your picture with the Sinnetia plants. When I was in England many years ago I tried to buy some to bring to the USA. Can’t be done. Then I tried ordering them to be sent without success. This year for Easter, I was finally able to buy them here in Wisconsin. It took a while, but I have a plant and an enjoying it while waiting for our April snow to melt. I enjoy your blogs. They brighten my day. I see from the weather forecast for the next 10 days ,more rain is predicted for Newbury. Here in Phoenix, Arizona we can go months without rain. Being from England, I do miss the rain and wish we had more. 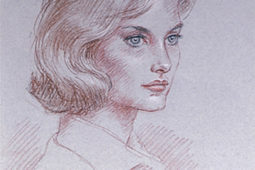 Thank you again for another very well written ,descriptive blog on Highclere. I can just imagine the lovely plants growing in the greenhouses waiting to be transfered to the gardens. I love seeing daffodils growing in the English lanes, fields, parks and gardens. Fluttering and dancing in the breeze . Perhaps I should use that as a key to walk among the daffodils for my next blog? On 3rd April this year, my husband Paul, myself Monica Together with our 2 married sons, daughters-in-law and 5 granddaughters visited, Highclere castle. It was a beautiful experience for all of us to have the opportunity to visit such a grand beautiful place. The well kept gardens and the beautiful rooms were majestic. The greenery and the huge Lebanon trees left us speechless. We come from the Island of Malta, a very small island, surrounded by the beautiful Mediterranean Sea. We get few inches of rain only in winter, and the summer is very hot. As a nation we love gardens, and we do have some gardens dating from the times of the Knights of St John years ago. Thanks for the opportunity of visiting such a lovely place. We visited Malta last summer and found it fascinating – you are right much sunnier!!!! The history of your Castle is so interesting and I love all the details you give us. I had never heard the term “Orangery” before even though I am an avid reader and am happy to have learned something new this morning. Really appreciate all the photos and floor plans of the Castle. Thanks so much. I find the history of Highclere fascinating and more so that you are still discovering its secrets. Here we would call the orangery simply a green house and in the west (Colorado). Those of us who do garden, dream of having our own greenhouse full of exotic plants, such as orchids, or even just a place to start our own garden plants–tomatoes and peppers, perhaps. Here an orangery’s worst enemy would be hail which has in recent years and put a few commercial green house growers out of business. And while you would like to see the rain stop, we would love to see the rains come for it is a very dry spring. I would so love to share our rain with you – today it could have been November! Thank you for this so interesting Blog regarding the “Orangery”. During all the Downton Abbey episodes I wondered about the gardens and longed for a glimpse of them. I look forward to every blog you post and so hope to see Highclere in person someday. My heritage is English and I feel so drawn to all things and places in England. They did film in the gardens a little – they sometimes pretended they were Maggie Smith’s Dower House though! 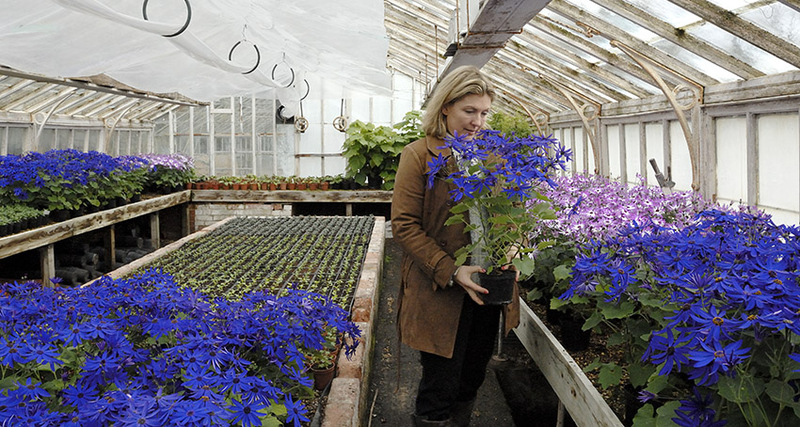 Orangeries or Greenhouses can be beautiful, and they can cheer you up on depressing rainy days. We had one attached to our master bedroom in a former house. On sunny days, it was warm and we would sometimes keep the door open to view the beautiful flowers and plants from the bedroom. It was fun to grow new plants from seeds, and my children and I enjoyed watching the different varieties of plants and flowers grow in front of our eyes. It was gorgeous too in the winter, with the flowers blooming against a snowy background outside. I often thought of putting a chair out there, just to sit and meditate, but never had time with small children to take care of. The only drawback was the care, spraying, and watering I had to do. It takes time, but greenhouses can be a wonderful hobby. They can be a wonderful extra room. Once again, Thank you for sharing. Sounds like you have a very busy life and bring much joy to many with your blogs which makes Highclere real to us. I loved seeing part of Mr. Barry’s original plan. We refer to them as “Greenhouses” here in Texas, but it sounds so much more charming to refer to them as an “Orangery” or “Heathery.” Even with the flower show episode in Season I, Fellowes never really expounded on the English fascination with gardening. I have to say that I’m quite jealous. Having enjoyed the opening day of your Capability Brown event a couple of years ago gave me a thought: will you plan a similar weeklong event celebrating Sir Charles Barry’s significant architectural contribution to Highclere and indeed to so much of England? I believe Cliveden has scheduled the occasional Sir Charles Barry lecture with great success. I quite agree and have already been researching! This year there is another week but it is all about “Script to Screen” which I hope will be great fun. 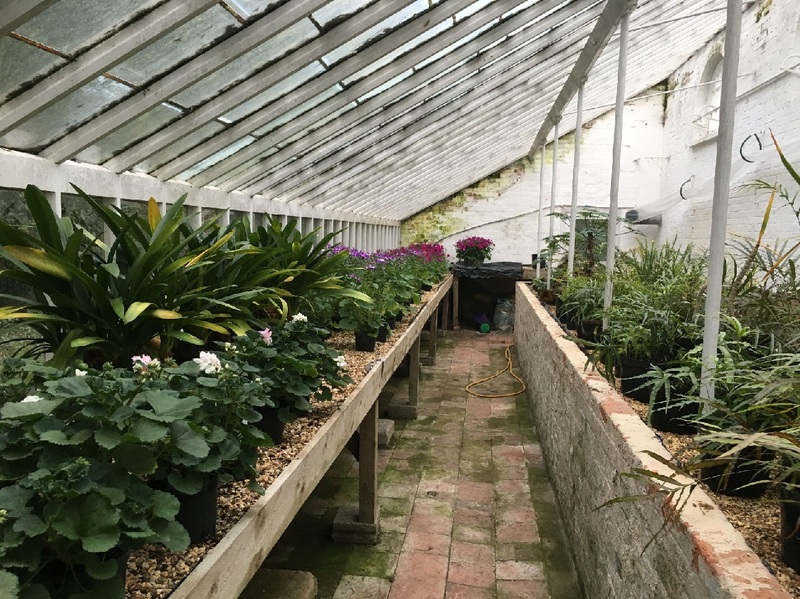 I’ve never seen anything grown in a Greenhouse, or Orangery, that wasn’t beautifully lush, and very full and rich in appearance. We have one close by, and always use it for starter gardening, and Christmas gifts. We’ve never been disappointed in the quality of plants, and vegetable grown inside the glass walls. I would think it of great comfort to you to know that you can control the fruit and vegetables growth from beginning to end because you have had the opportunity to watch it grow, and tend it in the stages of development before harvesting. I don’t quite have that luxury, but still manage to turn our entire backyard into a garden filled with edible items surrounded by flowers to keep the wandering rabbits away from the fruits of my labor. I must tell you, we have a Jack Russell that loves playing in the string beans, so I loved your photo of Scooby! 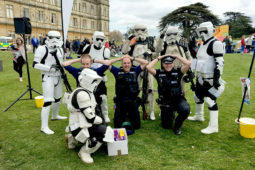 I m not sure that Paul and his team are quite so keen on Scooby – but he was careful!!!! As usual a lovely “post” which lifts my day. Can you tell me how you pronounce orangery – as I’ve heard 2 versions. The first of course is just as you would pronounce the fruit – orange with “ery to end. The other is with the emphasis on “rang”. Does that make sense to you? While you are all waiting for Spring, we in Australia are thankfully enjoying the cooler Autumn weather, with a slowing down of all things garden! Great article. Love the history of this. As an American that spent 9 years of my life as a child in England, I consider this part of my history. Please keep writing. My wife and I travel there often because it allows us to step back away from the hectic lifestyle in the USA. Your description and pictures of the “Orangery” are so informative. I had never heard the term before. I love all growing things and usually walk the grounds of my home early in the day to see what is new. I especially love your historical comments about each generations responsibility to preserve and improve your wonderful Highclere! It must be a huge responsibilty, and I applaud your family’s dedication and ingenuity in saving your estate for the future generations. Thank you, and I always look forward to your next blog. In W. Tennessee USA our very rural setting has so far seen new blossoms on Redbud trees, Dogwood trees, Forsythia, crabapple trees. A few dark purple iris are blooming, but usually there is a setback since last week it was 32F and snow flurries! The daffodils have come and gone, and the azaleas are pink and very lush! Again, thank you so much, Lady Carnarvon. May warm sunshine Spring come soon to Highclere and you may show us a “walk amongst the daffodils”! Another interesting post. When I visited a few years ( in April after a lot of rain) ago I enjoyed walking around the gardens and finding the statue. I love the old plans for the castle seeing how much it changed. I’m sure there is always something that needs fixing with never an end in sight. 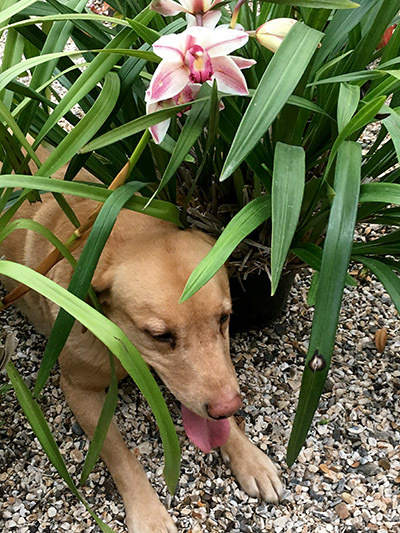 I love the picture of Scooby hiding under an orchid. As you’ve mentioned the Dower House is there still one? Looking forward to the next blog. As always, another interesting blog! Thank you for sharing so much of your life at Highclere. You and Lord Carnarvon are wonderful stewards of a beautiful place. A fun excursion around your beautiful home. Wish we were able to explore the beautiful grounds a little more during our visit. We were short on time. We are so spoiled with our weather here in CA – Our “Orangeries” don’t need to be in a glass house, there are orchards of them and people are always leaving them on ones front porch much like zucchinis in the summer – ring the doorball and run – since we can’t eat them fast enough. We take the surplus to the food bank. The fact I am up so early today was for a tennis match that was just cancelled due to RAIN! We just finished a very long drought so it is most welcome! Your living history will be much appreciated in the years to come – love your stories, keep them coming!!! My Doctor so loves the spring, she declares it begins on ground hog day (Feb 2nd)! Here in New England (CT) are discussing impeaching the ground hog! He predicted 6 more weeks of winter but here it is April 10th and we’re expecting snow tonight!! We’ve had 4 snows in 3 weeks. My daffies have not shown yet. But the chickadees are back. Saw a Snowy Owl being mobbed in the air by crows; very noisy. My daughter and I enjoyed a wonderful visit to you beautiful home last Tuesday. Despite the awful wet weather we enjoyed having an insight into life at Highclere. My daughter particularly enjoyed the Egyptian exhibition. I shall definitely return, hopfully in better weather so I’m able to enjoy the wonderful grounds. Do come back – the wild flower meadow is really worth a visit! Thanks for the update..is it REEEELY still raining? I am so sorry! We too have had a lot of rain (we don’t dare complain in Texas… I remember droughts that lasted five years and children went to kindergarten never having experienced rain). But my garden is emerald green and growing by the minute. The birds and squirrels are having a fine time. I sympathize about the wooden structure. I dare not tell the master of the house that the sunroom is awash every time it rains. Even the cats won’t go out there. It needs re-roofing and if I am honest it needs to be completely rebuilt, but oh! the expense. My neighbour has a son and a husband who are builders and although her garden is filled with timber, roof tiles and cladding, work has been at a snail’s pace all the years we have lived here. She says she hopes to see it finished by the time they bury her… but is not hopeful. The said relatives did indeed replace some wooden trim on the eaves… but almost before they left the squirrels had eaten a large hole in it. 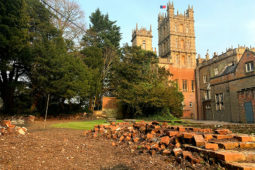 I suppose everyone has the same problems , perhaps my neighbour and I should run a TV series about our houses… but somehow we lack the glamour that Highclere has! Love to Scooby, who looks delightful framed by the orchid. Thank you, thank you, for writing these posts! They are both enjoyable and informative, and I never fail to learn something when I read one. Fascinating history, presented in delightful tidbits and tied to the present day! Much appreciated! Fascinating! I didn’t realize that glass was such a rarity in the 1800s. The first time I heard the term Orangery was in 1988, when my husband and I toured Kensington Palace for the first time. At that time, their Orangery was bare and locked up. It was eerie – as I peeked through the windows and tried to imagine what it looked like in the 1800s. Then, on another visit – I think was in 2005, the building had been brought to life as a lovely tea room with amazing treats. I was happy to see it being used again. In 2013 I took mother to tea there as well. I hope they are still using it. I wished I was able to see this. I was very fortunate to see your home last week. It was very special to have taken a photo with the 8th of Earl. It would have been lovely to see you. Your home is so beautiful. I was able to pick up a few copies of your book. I just arrived back home in the US and looking forward to start reading your book. I wished I picked up a few more copies. Hopefully I can order and have shipped. Looking forward to seeing your stories here as well. I heard form my husband – Sorry I missed you! Such a pleasure to have visited your home April 3, 2018. I had the pleasure of recognizing you as I walked from the parking to the ticket entrance. I did not approach as it was not a good day to be parking on the lawn. We were able to get in and out that day without any ado but it was a sad situation for others and the grass. I do so appreciate having to been able to enjoy your home. We had tea at the coachouse and saw the Egyptian display as well. History was at every corner. My daughter and I specifically traveled to the U.K. over Easter as Highclere was our goal. No matter the weather it was a wonderful day. Thank you for your blog and for sharing your home. I agree with everyone here, that at Highclere Castle, there is so much history to be seen, and live, which on the outside looking in so very exciting. However, I wish you had the time to write down the history of Highclere Castle from start to the present all in one big thick volume! I am currently reading about the “Souls” and before having bought this book, “The Unquiet Souls”, I read about them here and there: however, being able to read the whole history from start to finish is just wonderful. Oh, well, when it comes to the whole “History of Highclere Castle” your lovely blog will do for now!! Have a lovely spring when it does arrive sans the heavy rain. You are kind- I have many ideas about what to write next and I just find it hard to choose!! My partner has long wished to visit Highclere, and I managed to book a slot for this weekend which was fortunate as the weather was perfect. We just loved walking around all your beautiful gardens with the many varieties of Daffodil blooming in the sunshine as well as the early tulips. I have got many lovely photographs to remind us of a wonderful day, which was capped with an afternoon tea in the stables. PS The House and The Egyptian Exhibition were equally as good but the sunshine made the gardens seem ‘special’. Thank you so much for coming and the sunshine on Saturday was so welcome!